We decided to try out Salt House, a newish restaurant we've been meaning to get to. We were pleasantly surprised. The atmosphere was industrial yet warm and the service was friendly. We'll definitely be going back. 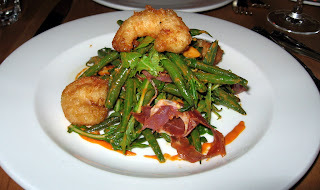 The spicy sauce and green beans were quite nice, but the shrimp themselves left something to be desired. The shrimp, although not overcooked, were more like bad Chinese food shrimp with a greasy flavor. 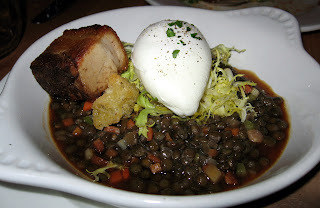 The pork belly was tender and delicious, and the lentils had a nice chew and were perfectly salted. The egg added a nice balance to the dish. We were a big shocked to find this tradional Quebecois comfort food in San Francisco--turns out one of the owners is Canadian. We had to order it. 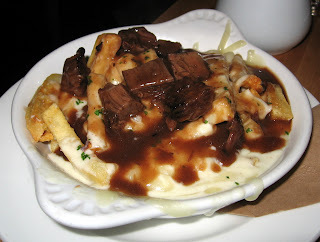 The short rib gravy elevated this pedestrian fare to new levels. It was quite tasty. Although this dish was far too expensive for the portion size and in relation to the other dishes, it was quite good. 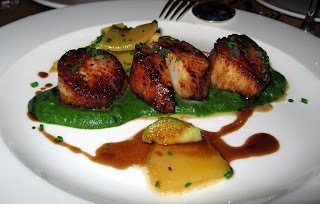 The scallops were cooked perfectly and the spinach was bright and rich in flavor. The brussel sprouts were a bit too crunchy though. Oo, very exciting! I have been wanting to try Salt House ever since it opened over there in the Financial District. Now that I see the pix, I'll be sure to visit! Looks great!